Non-applicability of Flexi Fare System for tickets booked on Privilege Ticket Order (PTOs) in Raidhani, Shatabdi, Duronto. Humsafar and Suvidha trains. Sub: Non-applicability of Flexi Fare System for tickets booked on Privilege Ticket Order (PTOs) in Raidhani, Shatabdi, Duronto. Humsafar and Suvidha trains. In the reference of above it is informed that as per rule para 2 (g) of the Railway Servants (Pass) Rules, 1986 ‘Privilege Ticket Order (PTOs) is an authority issued in favour of a railway servant which may be exchanged for a passenger rail ticket on payment of one third of the normal fare. 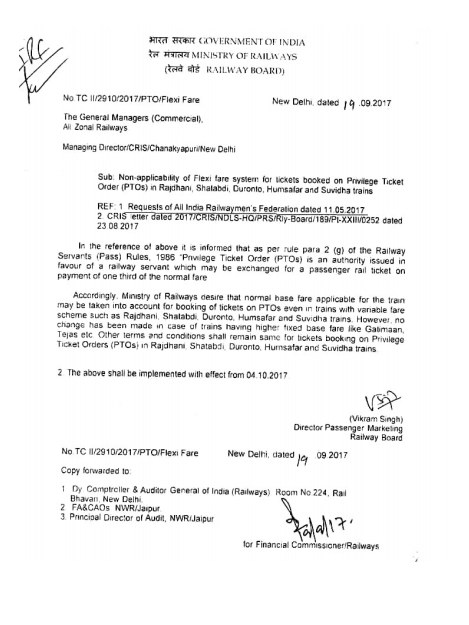 Accordingly, Ministry of Railways desire that normal base fare applicable for the train may be taken into account for booking of tickets on PTOs even in trains with variable fare scheme such as Rajdhani Shatabdi, Duronto. Humsafar and Suvidha trains. However, no change has been made in case of trains having higher fixed base fare like Gatimaan, Tejas etc. Other terms and conditions shall remain same for tickets booking on Privilege Ticket Orders (PTOs) in Rajdhani Shatabdi, Duronto. Humsafar and Suvidha trains. 2 The above shall be implemented with ettect from 04.10.2017. Central Government Employee News and Tools: Non-applicability of Flexi Fare System for tickets booked on Privilege Ticket Order (PTOs) in Raidhani, Shatabdi, Duronto. Humsafar and Suvidha trains. Normal base fare applicable for the train may be taken into account for booking of tickets on PTOs even in trains with variable fare scheme such as Rajdhani Shatabdi, Duronto. Humsafar and Suvidha trains.